Have you ever wanted to check out what your site or someone else's looked like a year ago or more? 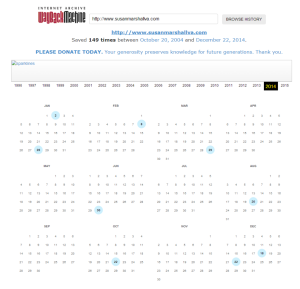 The Wayback Machine takes snapshots of websites over time and allows people to view these archived versions. Just enter your site url and you'll see the number of times your site was captured. It can be very interesting to see how your website has evolved if it's been around for several years. It can also be interesting to check out the evolution of other websites. The Internet Archive Wayback Machine is also stocked with web pages that are specially selected, through a service called Archive It, which allows anyone to build their own archives. A copy of everything saved goes into the Wayback Machine. Note: Internet Archive is a non-profit library of millions of free books, movies, software, music, and more.